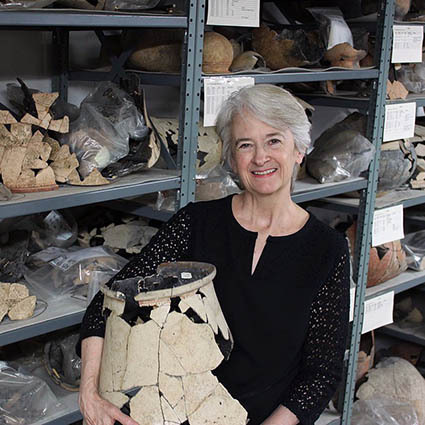 Dr. White is an internationally recognized archaeologist specializing in the prehistory of Southeast Asia since 1974, especially in Thailand and Laos. She is the world’s expert on the site of Ban Chiang, Thailand, named by UNESCO as a World Heritage Site in 1992 due to significant discoveries of a previously unknown civilization. From 1981, she has been Director of the Ban Chiang Project at the University of Pennsylvania Museum. She continues there today as Consulting Scholar. In 2001, White initiated an archaeological research program in Laos, the first American to successfully sustain a modern program in that country. The Middle Mekong Archaeological Project (MMAP) is exploring the prehistory of northern Laos in Luang Prabang Province, anticipating that light will be shed on precursor societies to the Ban Chiang Cultural Tradition. MMAP combines a cutting edge, international, multi-disciplinary research program with a training and capacity-building program for Lao heritage managers. White’s research over the years has been funded by the National Science Foundation, The National Geographic Society, and the Henry Luce Foundation, among others.